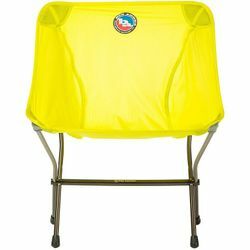 Big Agnes Skyline UL Chair. "I just love getting to camp after a long day hiking with a heavy pack and sitting on the cold, hard ground or a rock," -said no one ever. With a weight of just over 1lb., there's no reason you shouldn't have a comfy, four-legged chair to kick back and relax in. The Skyline UL Chair packs small, assembles quickly, and gives you the comfort you need to enjoy the backcountry spot you worked so hard to get to. Skyline UL Chair and Stool from Big Agnes on Vimeo.